Do you miss the halcyon days of having to hide behind the sofa and burying your face in a cushion because watching Doctor Who was frightening? Because you were terrified that something terrible might happen to the Doctor and because the monstrous villain he was battling that week was not only petrifying, but would also scar your psyche forever more? I do, or at least, I did until The Labyrinth of Buda Castle, Eddie Robson’s ode to the Hammer inspired era of Who typified by the Robert Holmes stories The Talons of Weng-Chiang and The Brain of Morbius, caught me in its chilling embrace. Having arrived in Budapest and intent on finding a good restaurant, the Doctor and Romana are compelled to put their dining plans on hold when they stumble across the “corpse” of the latest victim in a series of grizzly, and apparently random, murders. But as they’ve learned on their travels together, there’s no such thing as coincidence. They’re soon embroiled in a hunt for a seemingly immortal creature of myth and legend, one who has risen from The Labyrinth of Buda Castle to enact, and fulfil, his dreadful plans for humanity. Entering the ancient catacombs in pursuit of the quarry, the hunters soon become the hunted, as the Doctor slowly becomes aware that by becoming involved, they may well have doomed the entire Universe to the same appalling fate that awaits mankind. 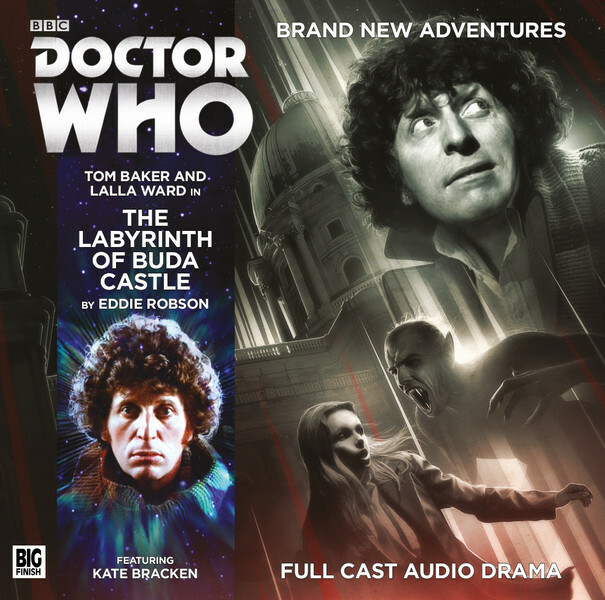 As Budapest begins drowning in a plague of violence, it’s left to the Doctor and Romana to finally lay to rest the evil that lurks in The Labyrinth of Buda Castle.